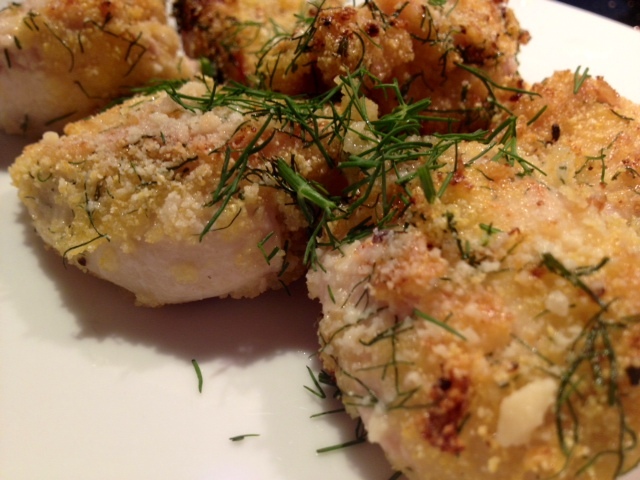 This chicken is a great summertime dish! The cornmeal adds a nice crisp to the outside of the meat without it being too breaded; while the dill and lemon add robust flavors. What better way to top it off than with parmesan cheese? Bon appétit! 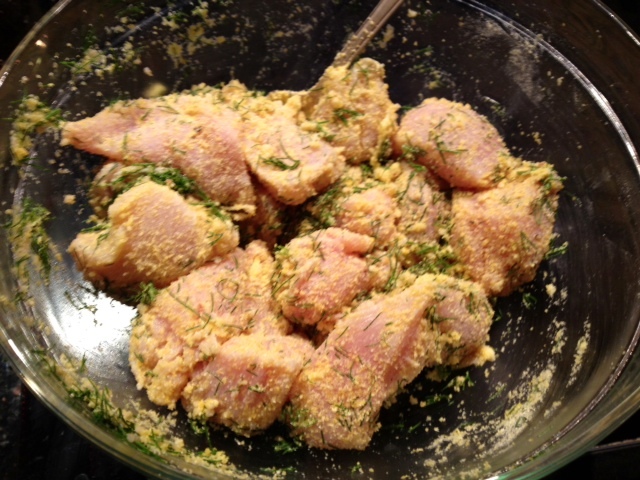 In a bowl, mix the pieces of chicken with the juice from 2 lemons, the dill and the minced garlic. 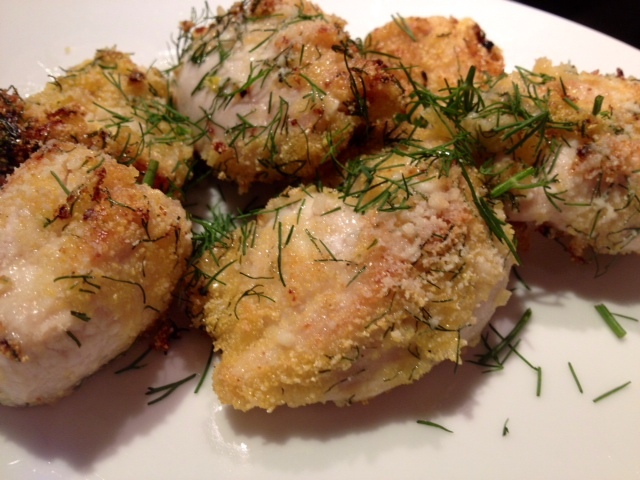 Toss all the ingredients together so the chicken is coated in the lemon juice. Add in the cornmeal and toss again to combine. Season with a dash of garlic salt and black pepper. In a large pan on the stove, heat ~3-4 tbsp of olive oil (enough to heavily coat the bottom of the pan) on medium-high heat. Once the oil is hot, add in a few pieces of chicken and cook on each side for about 3 minutes so it lightly browns and crisps. Repeat this process until all the chicken is browned. Put the browned chicken on a paper towel to drain any excess oil. 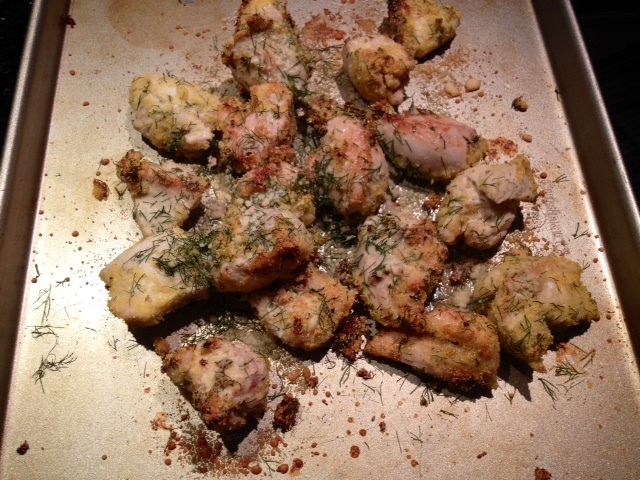 Place the chicken pieces on a baking sheet and sprinkle with the parmesan cheese and the juice from one lemon. Bake the chicken in a 350 degree oven for about 5-10 minutes (depending on the thickness of the chicken.) After baking, add a pinch of fresh dill and serve.